There are safety advantages to decking out your bike like a shining beacon when sharing lanes with petroleum-powered traffic, but the Clarity Bike explores the opposite end of the spectrum. This super-strong and stealthy cycle sports a see-through frame made from an advanced transparent polymer. Aiming to revolutionize how bike frames are engineered and produced, the creatives from Designaffairs Studio in Munich, Germany explored high-tech plastics used to make windscreens on fighter jets. Bikes have to stand up to a wide range of conditions – from extreme hot and cold weather to harsh impacts from rough terrain – all while delivering a smooth ride. A sturdy frame with a gentle flex offers the best of both worlds. A lightweight frame is also essential for riders climbing hills or those who have to carry their bike up a four-story walk-up. The bike industry has explored lightweight materials for years, and pro bikes are often made from carbon fiber or titanium. The Clarity Bike uses a polymer called Trivex to provide all of the characteristics of a perfect ride, while also rethinking the way frames are produced. This injection-molded material provides a seamless look with no welding joints. Designaffairs believes that frames molded from Trivex could be cheaper to produce, which would make them available to a wider audience when compared to the pricey pro bikes available today. Since Trivex has been used for the windows of military jets, we know that it is extremely strong, weather resistant, and lightweight – and it provides a gentle amount of flex riders appreciate. 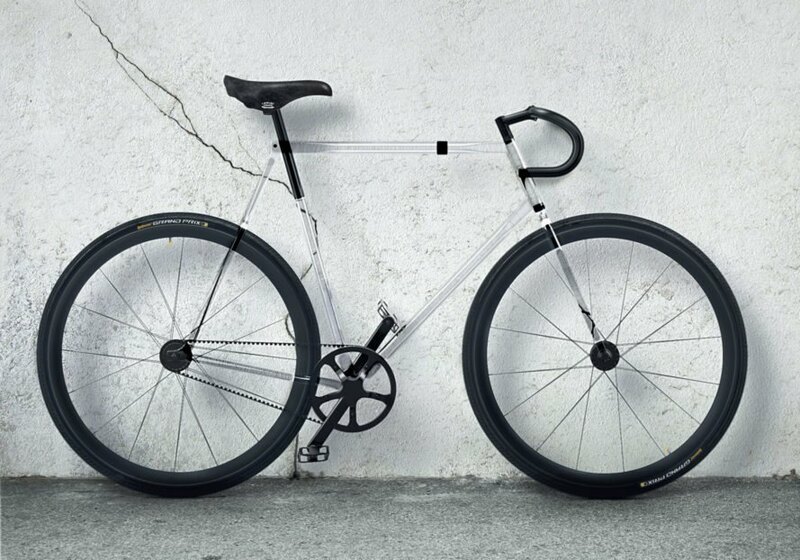 The concept bike frame is streamlined and looks similar to the fixies and road bikes that can be spotted on most city streets – although we’d love to see designers push the envelope and explore radically different forms with the new material. Kudos to Designaffairs for putting this concept out there to inspire and propel the industry forward.